We’ve had a great first two weeks of dance! We hope your dancer is settling into the routine and enjoying their classes. Here are a few items to review and news to be aware of as the dance year continues. An important part of dance class is being prepared for class, both mentally and physically. Please help your dancer to arrive on time, with the proper clothing, footwear, and hair for their class. 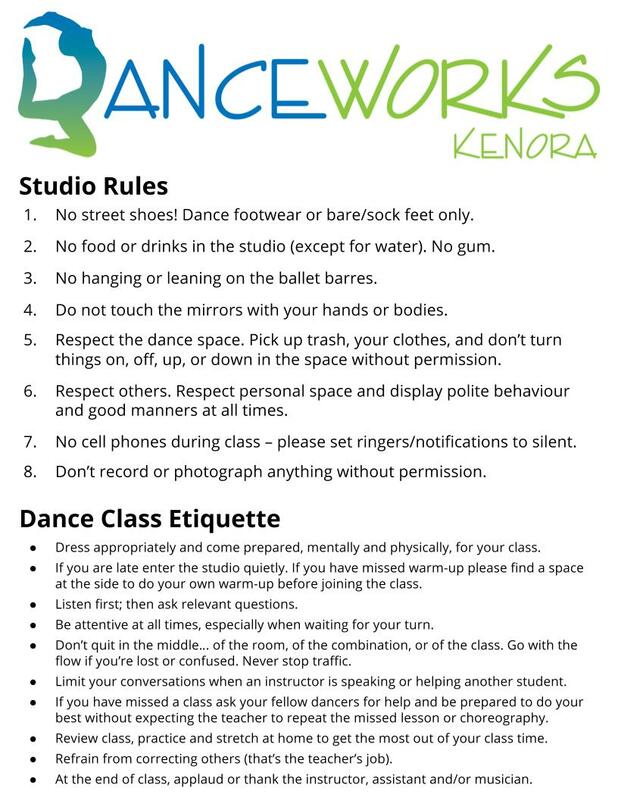 Remember, you can always check danceworkskenora.com/dress-code if you are unsure on class requirements. As we are now 2 weeks into the year the expectation is that all dancers have had time to find appropriate attire. If you are still missing some of your dancewear please let Ms. Erin know. Ballet buns are required for all Dance Foundations and Ballet classes. This is an important step and showing up to class without proper hair is the same as showing up without shoes, tights, or your bodysuit. Need a lesson on how to do a proper ballet bun, please watch this Bun Making Tutorial video. Hip Hop dancers, outdoor shoes are not permitted in the studio! Please be respectful of the studio space and bring indoor shoes to your class. Also, don’t forget your water bottle! Even the youngest dancers should have a water bottle as the break for water in these classes can be disruptive to the class if they don’t have water with them in the studio. We know the entry way can get crowded at class change times, please do your best not to disrupt the current class when you are entering or exiting. Monthly payments are due by the 5th of each month. If you are signed up to pay by credit card your payment will be processed automatically. A reminder that late or NSF payments will result in additional fees. Adults, you can dance and move with us too! Don’t forget that the multi-class discounts apply on a family basis which means that you can try an adult ballet, jazz, tap or pilates class at a reduced rate. The Fall 1 mini-session has already started but you can still join us or register for a spot in the Fall 2 mini-session which starts on November 5th. For dancers looking for additional training opportunities there are a number of dance conventions coming up in Winnipeg. The DWK Junior & Senior Performance Ensemble will be attending the Triple Threat Convention and any other DWK dancers that would like to attend are encouraged to register as well. Concert Hour Ballet will also be doing shows for students at both TA and Beaver Brae during the day. If you have questions please contact Erin at info@danceworkskenora.com or by texting or calling 807-464-3666. Please note that emails or text messages are Ms. Erin’s preferred methods of contact as they are easier to respond to quickly in between classes or after classes in the evening.